Campaigners say the £140m redevelopment would be too costly and would damage the environment and the city's heritage. 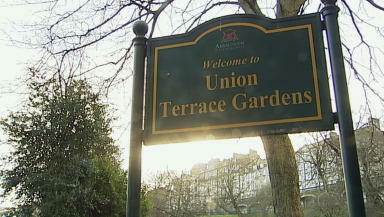 Friends of Union Terrace Gardens claim plans for a £140m redevelopment would be too costly and would damage the environment and the city's heritage. Local people have until Tuesday to make sure they are on the electoral register to take part in a referendum on the contentious City Garden Project. Sir Ian Wood, who has pledged £50m towards the plans and is paying the majority of referendum costs, promises to withdraw his support for the plans if the city's people are not behind them. The campaign group says development plans would mean most or all of the 77 mature trees in the garden would be felled. They are also concerned about the impact on the city's historical centre. Mike Shepherd, of the Friends group, said: "We are not concerned about a Yes result. "We talk to the people in the street when we hand out leaflets and they tell us they are against the development of Union Terrace Gardens. "They want to keep the park as an integral part of Aberdeen. "Without the part they feel that the character of Aberdeen would be lost forever. They don't want this to happen."